LASFSian Anne Morrel passed away July 17 after a 5-year long illness. She joined LASFS in 1987, worked on many Loscons, and actively participated in club service projects. She is survived by her husband of 30 years, William Ellern. 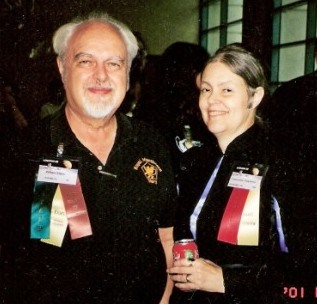 William Ellern and Anne Morrel in 2001. Photo by Dik Daniels. This entry was posted in In Passing and tagged Anne Morrel by Mike Glyer. Bookmark the permalink. PJ: Yes, I recall hearing that opener!